White Bass is one of Utah Lake's most popular and prolific fish. It is present there in very large numbers, and pound for pound is one of the hardest fighting freshwater fish. Coloration on the back is grey or charcoal, green, with silvery sides and white belly. They have five to seven longitudinal stripes on each side. The body is deeper and less streamlined than the striper. They are common in Utah Lake, where they usually dominate all other fishes. However, in the last couple of years, Utah Lake has suffered a reduction in the amount of white bass present. Some possible reasons for this are low water (drought) causing there to be no habitat for the young to hide, overharvest by some anglers, and disease. 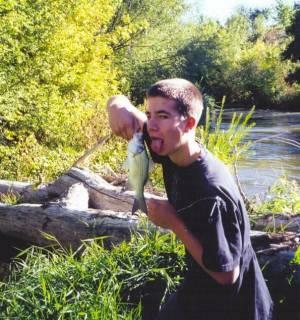 One thing is certain, though, when you do find a school of white bass, they provide lots of fishing enjoyment and fast action until the school moves on again. White bass will hit just about any small lure or bait. The real trick is finding a school. 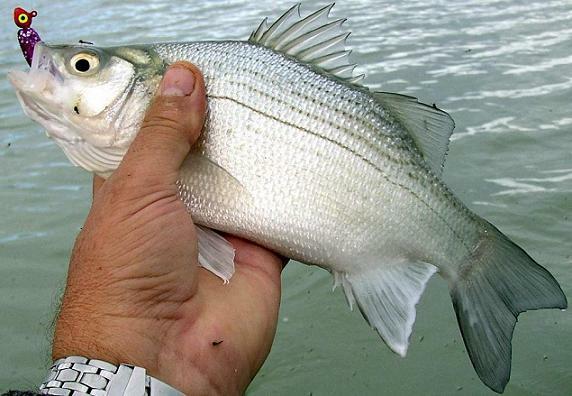 White bass often are located in or near the harbors in Utah Lake, near structure.